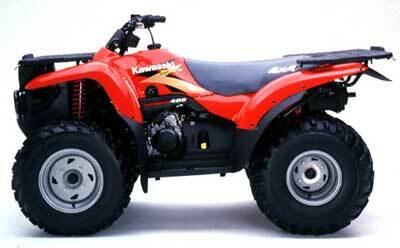 Three years ago Kawasaki introduced the Prairie 400 4X4 all-terrain vehicle to critical acclaim. It was named 1997 "ATV of the Year" by ATV Magazine and received a five-star overall rating by 4-Wheel ATV Action magazine. Consumers thought highly of it too. With its easy-to-use fully automatic continuously variable transmission (CVT), plush suspension, excellent handling and comfortable layout, the Prairie 400 4X4 was quickly one of the best-selling models in the industry. The Prairie 400 4x4 has composite cargo racks, multi-function digital display panel, aluminum wheels, new headlamp shape, full-time four-wheel drive with limited-slip front differential and comes in striking Firecracker red or Hunter green color schemes. Front: 88 lbs.Rear: 154 lbs.